Federal agent John Tipton heads for Wyoming to supervise the vote on whether to join the Union. One group of locals is using dynamite to terrorize the populace and a local newspaper editor is killed. U.S. Army Captain John Delmont takes a leave of absence to find out what happened to his missing father. Later he leads a wagon train to California and goes after the bad guys involved in his father's disappearance. This film was a pretty entertaining film and being a B-film, it was over in under one hour. In other words, it accomplished its modest goals just fine. While this means that compared to other, A-films, the movie might seem awfully simplistic, it was simply meant as a second film on a double-bill. These second features were often made by lesser-name studios and featured lower budgets and actors/directors/writers who hadn't yet established themselves in Hollywood or couldn't make the jump to the higher-level films--hence, the name "B-Movie". 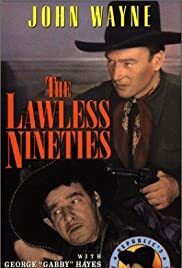 For years, John Wayne did many Bs and this one is certainly better than most (such as his "Singing Sandy" and "Three Mesquiteers" films). It gets the job done and the acting, for Bs, is very good. By the way, the role of the Major was played by George Hayes--that's "Gabby" Hayes and wow does he look and sound different playing a more serious role!